New natural gas discoveries in the Eastern Mediterranean might be a boon for the European Union’s efforts to move away from dependence on Russian energy supplies. In the current complex energy game between Europe and Russia, Italy could play an important role as an entry point for gas deliveries from Egypt, Israel and Cyprus, despite the current Italian government’s largely sympathetic stance toward the Kremlin (see EDM, April 10, 2018; June 6, 2018). On February 28, the United States energy giant ExxonMobil announced it discovered natural gas off the southwestern coast of Cyprus (Exxonmobil.com, February 28). The new find adds to other giant offshore gas fields discovered in the region such as Aphrodite and Calypso in Cypriot waters, Israel’s Leviathan and Tamar, and Egypt’s Zohr (Iai.it, February 23). 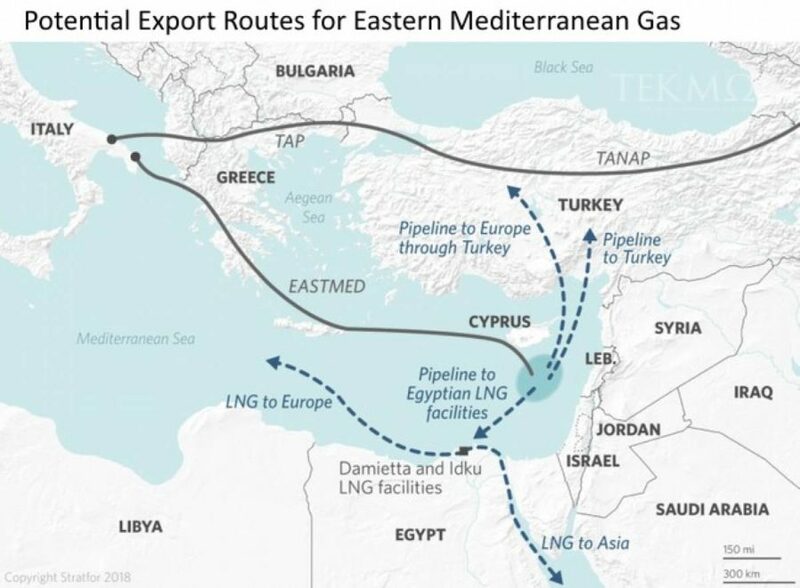 By the end of the year, the governments of Italy, Greece, Cyprus and Israel are expected to sign a multilateral agreement to build the EastMed pipeline, which promises to bring a natural gas bonanza to Europe (Edison.it, accessed on March 4). Russia is currently the largest single provider of gas to the EU, and supplies from the Eastern Mediterranean basin are seen as a viable alternative to state-owned Russian gas monopoly Gazprom. Currently, Russia accounts for around 40 percent of the European bloc’s natural gas imports (Ec.europa.eu, November 19, 2018). The planned EastMed gas corridor is projected to cost $7 billion and is backed by the European Commission. It is designed to initially transport 10 billion cubic meters (bcm) of gas per year from offshore reserves in Cyprus and Israel to Greece and, thanks to its connection with the planned Poseidon pipeline, onward to southern Italy. Yet, critics say the project is too expensive and faces serious technical challenges (Cyprus Mail, February 13, 2019; Bruegel.org, May 10, 2017). Furthermore, EastMed is opposed by Turkey, which has territorial disputes with the internationally-recognized Cypriot government in Nicosia, including competing claims to waters around the island. For their part, the Egyptians emphasize that the EastMed initiative is still in the feasibility study stage—a process that will take a couple of years to be completed—and note that Egypt could re-export the region’s natural gas to Europe now by using underutilized Egyptian gas liquefaction plants, more quickly and at a lower cost (Cyprus Mail, February 11, 2019). Indeed, Egypt is already moving in that direction. A new conduit will deliver natural gas from Cyprus’ Aphrodite field to Egyptian territory. Some experts argue the Cyprus–Egypt pipeline puts the EastMed corridor at risk because the latter needs all Cypriot gas to be commercially feasible (Haaretz, February 27). Interestingly, Italian Deputy Prime Minister Matteo Salvini, the kingmaker in Italy’s fractured coalition government led by the anti-establishment Five Star Movement and the nationalist League party, is a supporter of the EastMed gas pipeline (Startmag, December 13, 2018). Salvini’s Russia-friendly League is also endorsing the completion of the Trans-Adriatic Pipeline (TAP), which the Five Star Movement has tried to block by raising environmental concerns (Tpi.it, February 27, 2019; see EDM, November 5, 2018). TAP is the westernmost section of the EU-supported Southern Gas Corridor (SGC), a planned system of conduits to carry natural gas from the Azerbaijani Shah Deniz gas field to Italy, via Georgia, Turkey, Greece and Albania. TAP is designed to pipe 10 bcm of Azerbaijani gas to Europe by 2020, with the target of doubling supplies in the following years. The EU aims to diversify gas imports away from Russia with the help of EastMed and TAP, in addition to other energy transit projects. In this respect, Italy’s support for the two gas pipelines could be a source of friction between Salvini and the Kremlin, whose relations are reportedly close. A recent journalistic investigation claims that an aide to Salvini negotiated with the Kremlin to secure Russian funding for the League’s European Parliament election campaign (L’Espresso, February 21). But other issues risk damaging the relationship between the Italian leader and Moscow. Salvini has so far done nothing to cancel or ease economic and financial sanctions that the EU leveled against Russia in response to its annexation of Ukraine’s Crimea in 2014 and armed intrusion into Donbas. Salvini promised to do so last spring, after his rise to power. The Italian deputy prime minister is also trying to build a political axis in the European Parliament with right-winger Jaros?aw Kaczy?ski, the leader of Poland’s ruling Law and Justice party, who is a staunch critic of Putin’s Russia (Corriere della Sera, January 9). Moreover, in sync with the United States, Salvini has expressed support for the interim government of self-declared President Juan Guaidò in Venezuela, who is challenging embattled de facto President Nicolás Maduro, an ally of Russia in Latin America (Il Giornale, February 4). Moscow has been publicly silent on Salvini’s recent moves and declarations, especially as far as natural gas exploitation in the Eastern Mediterranean is concerned. Russian leaders continue to say that their gas is cheaper for European consumers than other sources, and Europe may need new imports by 2030 because of falling production at home (RT, February 28, 2019; TASS, August 2, 2018). Nevertheless, Italy wants to diversify gas suppliers and become a gas hub in southern Europe, be it through the EastMed pipeline or Egypt’s shipments of liquefied natural gas (LNG). Italian state-owned oil and gas producer ENI, the leading company in the exploitation of the Zohr supergiant gas field, has already advanced the idea of turning Egypt into a hub to pipe local, Israeli and Cypriot gas to Europe (see EDM, April 10, 2018). The Kremlin has had to walk a fine line with regard to ENI’s strategies in the region, given that Russia’s Rosneft has a 30 percent stake in the Shorouk concession, where the Zohr gas field is located. As Italy seeks to raise its energy profile, it is also aligned with the US and some countries in Central Eastern Europe against Nord Stream Two, the pipeline project designed to double the preexisting natural gas conduit that runs under the Baltic Sea and links Russia to Germany (Europa Today, February 4, 2019; see EDM, November 5, 2018). The capacity of Nord Stream One stands at 55 bcm, and Russia’s state-run gas monopoly Gazprom wants to complete the parallel Nord Stream Two by the end of 2019.